Through April 29, Rockefeller Center is pleased to host the MICRO Smallest Mollusk Museum, a six-foot tall multimedia exhibition exploring these fascinating sea creatures in a fun, interactive way. We talked with MICRO co-founder Amanda Scochet about the origins of the museum and what you can expect when you stop by. She and co-founder Charles Philipp will make a special appearance in the Concourse on Saturday, April 21, from 11am to 1pm, giving visitors a guided tour of the exhibits. Tell us a little about your backgrounds and the origins of the MICRO museum. Charles is a media producer and I’m a computational ecologist. We formed MICRO because we think museums are incredible places for families and communities to connect. So we started taking the best things about museums and shrinking them down into six-foot boxes that everyone can access. 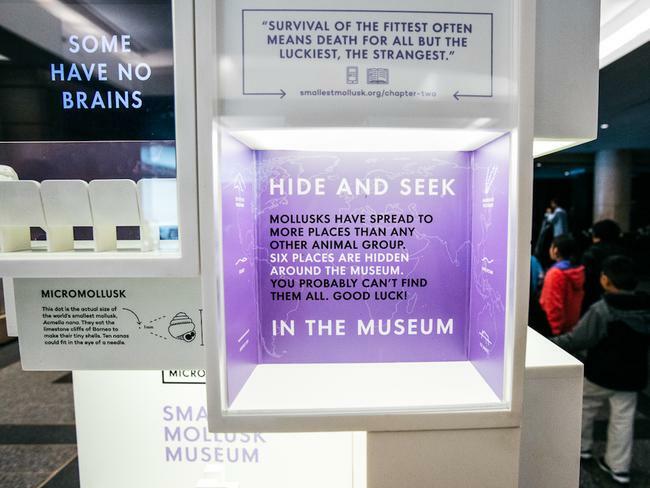 The Smallest Mollusk Museum at Rock Center is a six-foot-tall science museum that’s packed with exhibits exploring our slimy sidekicks the mollusks and the last 650 million years of life on earth. Why mollusks? What about them inspired you? Humans think mollusks are weird; their bodies are boneless, they’re covered in slime. Horror films are full of mollusk-inspired aliens with tentacles and armored shells. We wanted to get to know these aliens better. The more we learned the weirder they got, but everything else began to feel weird too, including us humans. It felt weird that 70% of an octopus’s brain would be spread out across its arms, but it also feels weird that 100% of our human brains are contained in our heads. It felt weird that the chiton has hundreds of eyes made of stone...but isn’t weirder that we only have two squishy eyes? Is it stranger to be able to perceive magnetic fields, or stranger not to? What's on display at the museum? What will visitors experience? Our team of engineers, designers and storytellers at MICRO worked with over 30 scientists from the world’s leading research institutions to develop the exhibits, which include two miniature movie theaters, a full-sized holographic aquarium packed with strange beasts, the world’s first 3D-printed octopus brain, and a bucket of slime. There’s always a vibrant conversation going on there, like: What is with these strange alien-y mollusks? Why do octopuses have brains that are wrapped around their throats, and distributed across their eight wiggly arms? Does each octopus arm brain have its own personality? What will visitors learn about ecology and protecting the planet? Visiting the museum reminds you that you’re part of a much bigger natural system. At the moment, many mollusk species are struggling to survive the impact of human-related environmental changes. On a local note, NYC used to have the largest oyster beds in the world. But overharvesting and water pollution wiped them out. Lots of people who visit ask what they can do to help the mollusks, so we put together a series of 10-minute, online "action packs" that you can do online. We think of environmental problems as big and complex, and they are. But small actions add up fast. For example, your house probably gets over 625 pieces of junk mail a year. If we all unsubscribed from our junk mail, that would make a huge difference—you can find out why and how over at our website. Do you have an age range in mind for viewing the museum? It's designed for everyone. We’ve tucked secret delights for every age inside those six feet! The holographic aquarium, which is right at children’s eye level, is definitely a big hit. What do you hope stays with people from the experience? We hope that it leaves you feeling more connected with the world around you, as well as to the people you encountered while exploring. As an ecologist, my personal favorite thing about visiting is watching New Yorkers, who can so easily feel disconnected from the natural world, suddenly remember that they're living on an island, surrounded by waters that are teeming with life. How does the museum interact with the environment at Rockefeller Center? Unlike in large museums, where people spread out, the Smallest Mollusk Museum brings people together. So strangers get to meet each other, and explore, and share a moment. That’s why we’re delighted to be partnering with Rock Center—not only is it iconic and beautiful, it also brings people together from all over the country and the world. It’s a perfect home for the museum. What are some resources for learning more? We have a bunch of free resources available on our website. That’s where you can read the Smallest Mollusk Museum book and stream the audio tour, which is packed with really incredible stories about mollusks and voiced by the excellent Sean Rameswaram from Radiolab and Vox. Tell us about other MICRO museums and what's in the works. At MICRO we’re just about to start public testing for our second museum series, the Perpetual Motion Museum. A physics and engineering museum, it explores humanity’s age-old quest to understand and harness energy. It might even make a surprise appearance at Rock Center! We’re also launching our science advisory process for our third museum series. But that’s a secret! MICRO's Smallest Mollusk Museum is on view in the underground Concourse at Rockefeller Center (between West 49th and 50th Streets and Fifth and Sixth Avenues) through Sunday, April 29, until 10pm daily. It's located in the Town Center area between Starbucks and the Rink.